…I raced home from the run up to Strathgordon aboard the S 1000 R to make the river cruise on the Derwent, whereupon I added a tenor, a technician and a teacher to the rich BMW palette. Again, everyone was having the time of their lives. Next morning I was aboard the brilliant R 1200 RT. Safaris by nature are all about the journey, the more kilometres the bigger the smiles, so the group gamely headed over the Tasman Bridge past Bellerive and past the lush green fields of Lindisfarne before gathering at Richmond for coffee. What struck me as the kays clicked by was Tasmania’s resemblance to NZ’s south island right down to stealing their town names like Queenstown and Glenorchy. When the super continent Gondwana broke up about 70 million ago, it appears what is now Tassie was part of the same land mass as the NZ south island, while Victoria was connected to the north island. Oh for geology. The run up the Midlands Highway to the old convict town of Bothwell was happily narrow and sinuous. We stopped for a quick breather at the café/fuel station before heading across the deck to the Steppes State Reserve. I tucked in behind a big bloke aboard a GSA, and what a fang it was. Fast and seductive, this superb ribbon of bitumen made interesting by random deposits of gravel will stay with me forever. It couldn’t get much better than this, but I was wrong. After 46km of super-touring bliss, we stopped at the turn off at Poatina Road, where GSA said he would wait for his mate. 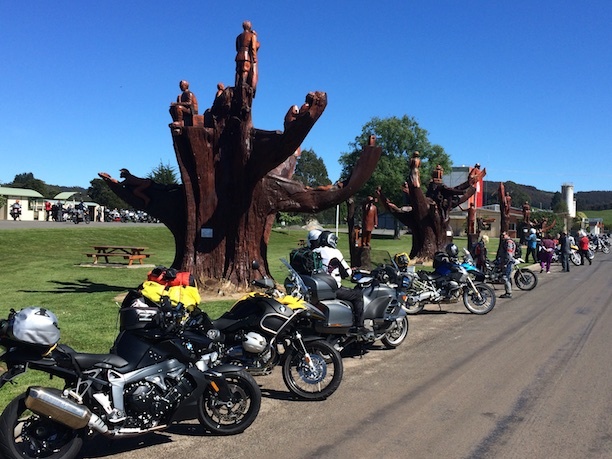 I continued along the fast and flowing sweeps and came across one of the most unusual sights I have ever seen – a cemetery of dead gum trees on my left. Dozens of massive off-cuts the size of small cars lay dormant in an abandoned paddock, and were so big they looked disturbingly out of proportion with the adjacent smaller gum trees that stood as natural tombstones to these grey wooden behemoths. I pressed on to the slippery dip hairpins on the run down to Arthurs Lake, and caught up to another GS, this time with a pillion aboard. The loaded GS passed a number of geared-down trucks with my RT in tow and when the traffic cleared, the GS upped the pace and how lively it was. Miles Davis and Geoff Seddon had also caught up, and too fell into the surprising slipstream of the two-up GS. With temps hitting the high 20s, we filled up on fried giblets and fuel, and headed back down to the junction for the final run into Launceston less than 100km away. 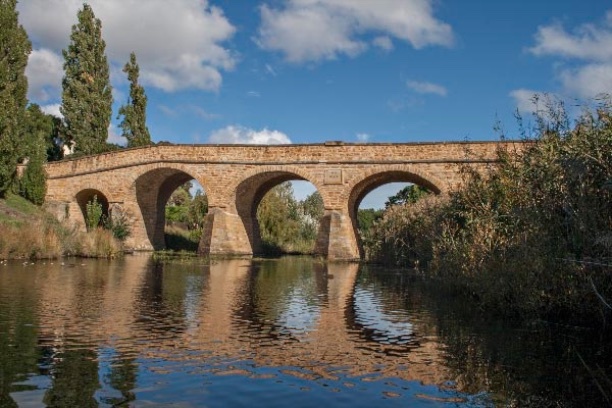 That morning, Miles alerted the TS crew to an alternate route that ventured to the east coast via Bicheno and the Elephants Pass before looping back through Fingal and Longford to Launceston. Miles said it was a five-hour trip. It was already 1:30pm, and we wanted another ride but five hours was an awful long time in the saddle but the hour run into Launceston was too short. I asked Miles how far the east coast loop was – 325km. That’s not five hours, I protested, less than four even with stops, but I was still prevaricating. 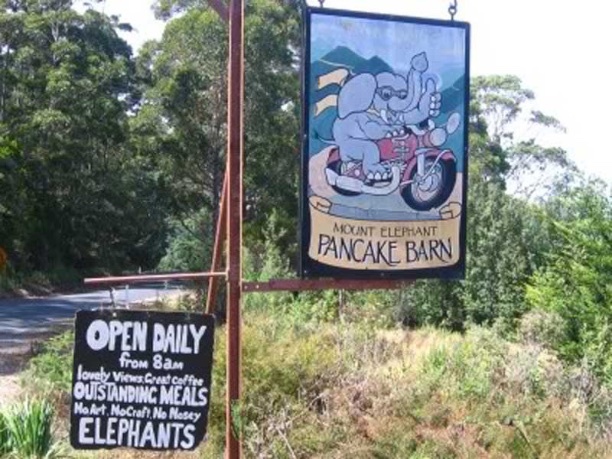 You may recall in Part 1 of this story that in 1981 I turned down the invite from the charismatic president of my college motorcycle club to join him and his gang on a Sunday ride. That president was Geoff Seddon. Over 30 years later, Seddo was asking me again, “what do you want to do?” and as I ummed and ahhed, he cut through the crap and said, “c’mon let’s go,” and I knew immediately he was right. 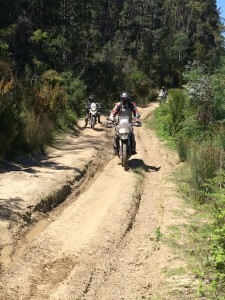 I jumped on the RT, leading Seddo to the mid-point village of Campbell Town. The first 30km scythed between low-lying crops before we hit the brilliant Lake Leake Highway. Open and insanely fast with a magically grippy surface that never wavered in its consistency, the LLH played host to one of the most memorable rides of my life. My only regret is that I didn’t dial the RT into ‘Dynamic’ mode. By the time we reached the gorgeous coastal town of Bicheno, Seddo and I were absolutely buzzing. Miles arrived at the blowhole five minutes later aboard his K1300, a hootin’ and a hollerin’ from beneath his lid. He’d had the time of his life too. A whole bunch turned up a bit later including John, Donovan and Frank. With the Safari gang in town after such an exhilarating ride, motorcycling simply does not get any better than this. We looped back to Launceston into the hot setting sun, the 20th anniversary dinner beckoning 24 hours later. Somewhat surprisingly, there was only four us who had attended the very first Safari to Fraser Island; Ian Anderson, former BMW employees Steve Adcock and Steve Anderson, and myself. The former three each spoke humorously of their memories over many Safaris, Ian leading the way with his fond recollections from Safari 1 notably the infamous antics of Mal ‘Second Gear’ Potter and the late Baron Herbert de Longueville. The Safari is now bigger and even more diverse, but what hasn’t changed is its ability to surprise, delight, challenge and amaze. When former BMW Motorrad boss Chris Van Wyk first came up with the Safari concept in 1993, I thought it was too grand to survive even year one. I’ve never been so happy to be so wrong! BMW rider Glenn Allerton (above) has continued his clean-sweep of the QBE Australian Superbike sessions at Tasmania’s Symmons Plains Raceway, winning today’s 16-lap race ahead of Suzuki teammates Wayne Maxwell and Robbie Bugden. 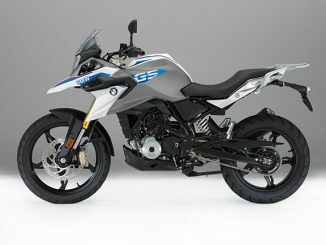 Is BMW’s ‘genuine GS’ learner genuine BS?